The freeway camera system was shutoff in July, and Redflex official spokeswoman Shoba Vaitheeswaran was quoted saying, “This should be a wake-up call to everyone in the community to be even more careful and watch for a large increase in aggressive, dangerous driving,” implying that the Arizona freeways would never be safe again without cameras snapping photos of drivers. Shoba was undoubtedly hoping that drivers had forgotten that the freeways were just fine before the states’ failed money-making scam began. 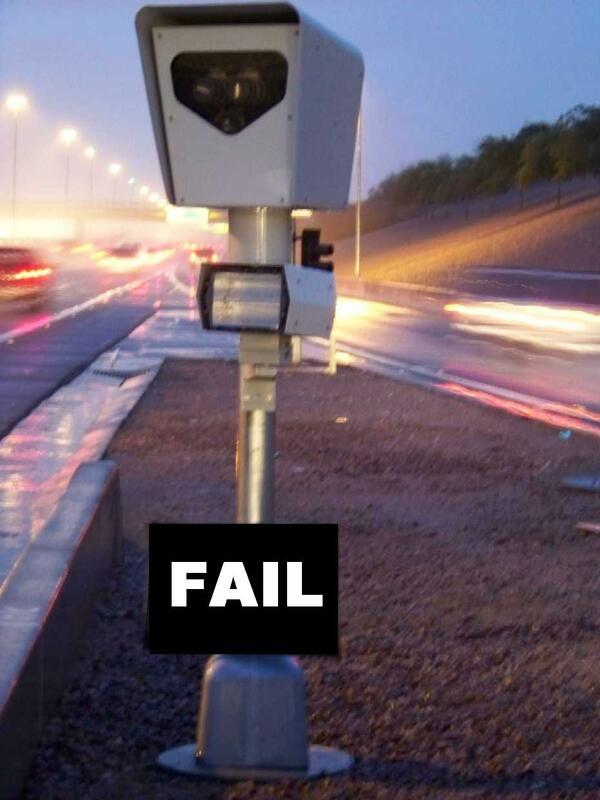 News/Talk 92.3 KTAR’s traffic reporter, “Detour Dan” Beach, believes drivers are taking advantage of the speed cameras disappearance. But even so, it does not appear to have made the roads any more dangerous, as Beach says that he has not seen an increase in crashes. This entry was posted on Monday, September 20th, 2010 at 2:38 pm and is filed under Photo Radar: Discredited, Redflex. You can follow any responses to this entry through the RSS 2.0 feed. You can leave a response, or trackback from your own site. I am surprised all hell hasn’t broken loose. Arizona is very dangerous and only constant surveillance like they now have in NYC can keep us safe. We need ED-209’s or Robocops strategically placed throughout the city….to surveill and enslave. I have noticed a significant increase in DPS presence on the highways since the cameras were shut off. Makes me wonder how many officers were inside watching video all the time. Saw one on I-10 in Tucson yesterday who had pulled over a pickup truck with an extremely precarious load. It was obviously an accident waiting to happen. A camera can’t do that. I definitely feel safer now, and I still drive the speed limit. Halliday is the only chance DPS has to regain any respectability, although, I don’t think that will help much. You don’t think someone was looking at their speedometer instead of paying attention to surrounding traffic and going with the flow, do you? It might be worth FOIA’ing this accident report. I saw someone today slam their brakes at the cameras today. It was tupid of ADOT and DPS to remove the signs. His argument is that the insurance companies include accidents that might occur a little down the street from the intersections with cameras. Even if this is the case, then the conclusion can still be drawn that installing cameras at the intersections caused accidents to increase in the immediate area. It’s incredible that these elected officials will NEVER acknowledge a report that doesn’t agree with their position. Good for him. Another quality news article from our local “news” organizations. Would be nice to know why they dropped the charges. I just caught it on the news again. There was a quick comment about lack of evidence from the state, or something like that. So I’m sure they tried to do discovery and the state just didn’t want to comply or establish precedent for future cases. Professor Pendyala and his “control grid.” He’s officially a creep.